It’s the time of year when businesses all across belfast are focused on getting the best value from their marketing budgets. We are no different ourselves and today we’re outlining some of the best value products we can print for your business, quickly and cost effectively. We use desk pads and notepads ourselves to great effect and distribute these among our own clients. From this we know they are extremely well received and used regularly. Having a constant reminder of your business in front of your clients is priceless and will ensure they remember who is best to contact for the products and services you sell. You get an urgent phone call but you can’t find a piece of paper. Well why not draw on your desk, literally. Printed on 120gsm uncoated paper these handy desk pads will ensure that you always have a piece of paper when you need it. Each desk pad comes with 50 sheets and is available to print in A3 and A2 sizes. As an essential item for any office or home, these handy notepads are an easy way to jot down reminders and to keep track of your everyday tasks. Printed on easy to write on 120gsm uncoated paper, each sturdy pad comes with 50 sheets glued on one edge. Our notepad printing covers A6 to A4 sizes, so there is always a suitable print option. Focus on helping your customers rather than yourself and you will be successful! Notepads are a wonderful tool for this. They are functional and provide a welcome note taking device. This is one printed product we highly recommend. 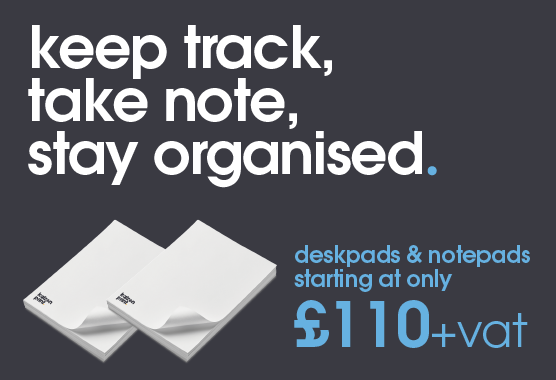 To view our full range of desk pads and notepads you can visit http://kaizenprint.co.uk/small-format/notepads and choose the type of writing pad best suited to your business needs.